Everything you ever wanted to know about shooting video in Atlanta. Prior to arriving in a new city, every producer needs the lay of the land. This guide explores everything about Atlanta, GA that producers need to know. Known for the railroad originally, Atlanta has become one of the country’s most financial and commercial cities. Its diverse and progressive views push Atlanta to one of the most civilized cities in the country. With it being the capital of Georgia, it serves great purposes for businesses, entertainment, shopping, restaurants, and much more. Atlanta was actually one of the touchpoints during the Civil Rights Movement along with the hometown of infamous Martin Luther King Jr. It has the largest aquarium in the southern hemisphere as well as the popular spot the College Hall of Fame. Atlanta is one of few cities in the US that offers almost anything for anyone. The Atlanta Beltline is one of the most popular things to do while in Atlanta. It was a former railway corridor that now serves as a multi-purpose trail, 2,000-acre parks, and plenty of historic railcars to explore. The Atlanta History Center and the Center for Human Rights both serve as entertainment and educational spots to visit while in Atlanta. If that’s not your thing, the College Hall of Fame, World of Coca-Cola, and the CNN Center all serve as centers to explore for all ages. Atlanta is a major spot for entertainment, festivals, and concerts. The Atlanta Jazz Festival comes to town every spring along with the SweetWater 420 Festival. Music Midtown is one of the largest and most popular festivals hosted in the fall. Atlanta serves as host to many sports teams including their pro-football team the Atlanta Falcons who played in the Super Bowl for the 2016-2017 season, pro-basketball team the Atlanta Hawks, pro-baseball team the Atlanta Braves, and the major league soccer team the Atlanta United FC. Along with their pro teams also include college sports occasions as well. Atlanta offers opportunities for higher education at Georgia Tech University, Georgia State, Emory University, and Atlanta Technical College. There more than enough options when it comes to hotels while staying in Atlanta. Hotels located downtown will be more expensive than those surrounding the city but will benefit you by their location and accessibility to restaurants, shoots, and events. Some of those hotels include the West Atlanta Midtown Hotel and the Sheraton. If you would like to stay closer to the airport, the Hilton Atlanta Airport Hotel and the Loews Atlanta Hotel are great options. Because of Atlanta’s high volume of business and entertainment, its traffic can be bad. The driving times for most locations will be about 15 minutes; the drive to the Hartsfield-Jackson Atlanta International Airport from downtown Atlanta is also 15 minutes. 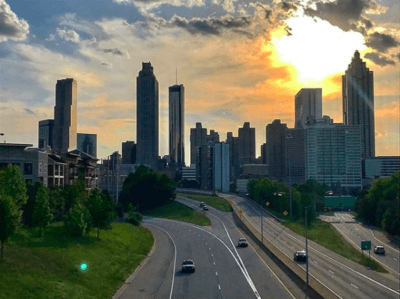 Driving or getting an Uber are the best options for transportation around Atlanta. Atlanta’s climate is pretty hot and humid with summer temperatures reaching 90 degrees. Their winters can range from high 50s to low 30s. Snow is not common and precipitation is average. Click HERE for the current 10-day forecast for Atlanta, GA.
Crews across the country have a set of guidelines by which they conduct business. And as different as each city is from another, so are those guidelines. Every producer should have a basic understanding of each city’s standards. Shoots in Atlanta are based on a ten hour day and the crew is on the clock at the specified crew call. Overtime at a rate of time and a half begins after ten hours. If your shoot takes the crew to a distant location, travel time can be expected. A distant location is any location outside a circle with a 30-mile radius drawn around the city. But all of these are just guidelines; certainly, verify with your crew their specific policies. If you have additional questions about Atlanta you can always contact the city’s Chamber.